Biography What was meant to be a short nap seems to have turned into eternal rest for sweet Sue Pea. Heart Quote I won't wet the bed... I promise. Sue Pea, the Dozing Girl is a seven year old portrait ghost that died in her sleep. Her name comes from the Japanese onomatopoeia for someone sleeping, "スー・ピー", "Suu Pee". 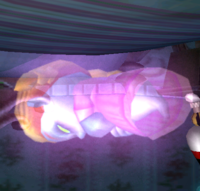 During the events of Luigi's Mansion, Sue Pea resides in the Guest Room on the second floor of the titular mansion, where she sleeps on a bed attached to the room's ceiling. She is one of the five optional portrait ghosts. Her portrait number in Professor E. Gadd's gallery is 9. When Luigi first enters the room, Sue Pea tells Luigi to go away. Examining her with the Game Boy Horror reveals that she promises to never wet the bed, giving a clue on how to provoke her. To do so, Luigi has to spray water from his Poltergust 3000 at Sue Pea, which can be done after vacuuming a Water Elemental Ghost produced by a vase in the adjacent room. After spraying her three times, Sue Pea's heart is exposed and Luigi can pull her in with the Poltergust. While being vacuumed, Sue Pea attacks by tossing dolls, dealing five Hit Points of damage with each successful hit. If Luigi fails to capture her, she resumes sleeping and Luigi has to douse her with water again. After capturing Sue Pea, the Guest Room lights up and a treasure chest appears on the ceiling, out of reach. Leaving the room causes a quake to happen and returning shows that the guest room has turned right side-up, with the Treasure Chest now accessible. The chest contains a Gold Bar and a Silver Diamond, along with other minor treasures. Sue Pea has pale blue skin, light green eyes, and blonde hair tied in pigtails. She wears a pink nightgown with three jeweled buttons, a white collar at the top, and a peach-colored trim at the sleeves and the bottom. Suu Pii Onomatopoeia for someone sleeping. The portrait in the Guest Room. A black-and-white picture of a person similar in appearance to Sue Pea can be found on the north wall of the Guest Room, possibly depicting her when she was alive. This page was last edited on November 11, 2018, at 16:15.